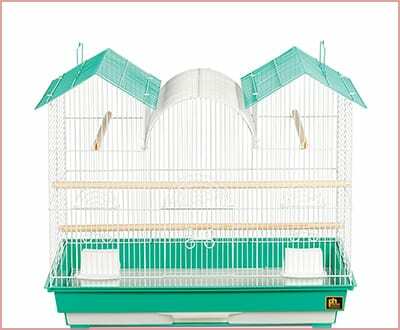 If you’re looking to bring a bird into your home, then you will need to find and purchase a suitable cage. 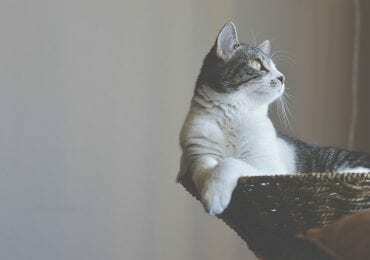 This article goes over some of the best bird cages available for various small to large birds, such as finches, conures, lovebirds, parakeets, parrots, canaries, cockatiels, budgies. 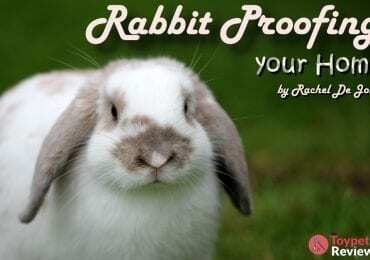 The criteria used in compiling this list includes price, quality, cage size, and the user opinions of experienced bird owners. 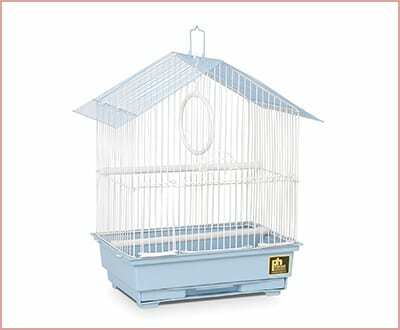 If you have to move your pet bird from one location to another often, we recommend this travel bird cage from Prevue Hendryx. It comes with a perch and 2 dishes made of stainless steel, perfect for food and water. The access door is on the side of the cage, which makes it easy for the bird to walk into it. Easy to store, folds flat. Comes with water and food dishes. The bottom grille is easy to remove. Not suitable for smaller birds. Ideal For: Housing a small bird (finch, canary) long-term. An ideal travel or hospital cage. 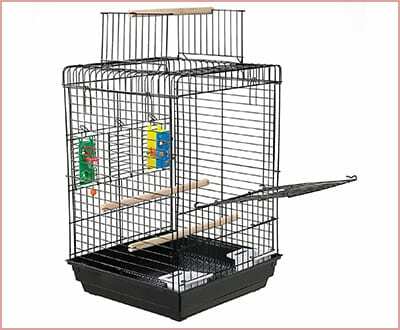 This Prevue Pet model is a very nice little cage that can hold your bird while you clean his regular cage, or go on a trip to the vet. 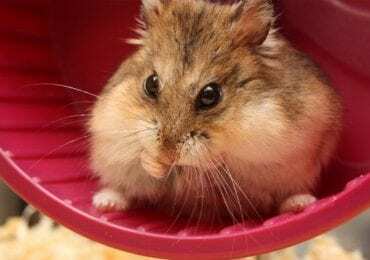 It could also be the permanent home of a small finch or canary. The design is simple and effective, and the cage won’t take up much space. This is an excellent option for first-time small bird owners on a budget. An excellent travel or hospital cage. Not large enough to house a bird that is parakeet-size or larger long-term. Not a good option for multiple small birds. Ideal For: A single cockatiel. For a new bird owner bringing home their first cockatiel, this cage is an excellent choice. The cage is very lightweight, and specifically designed to stimulate your bird. 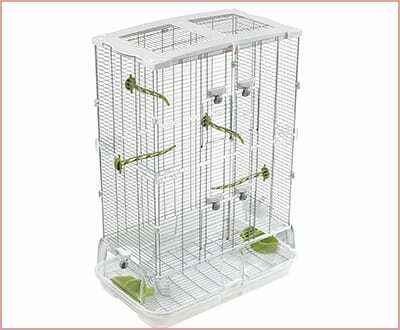 It is very easy to add toys to this cage to keep your pet entertained. A highly interactive and stimulating cage for your intelligent bird. Easy to add and remove toys. Not ideal for small birds (including parakeets), as the bar spacing is too wide for them. A little on the small side for some cockatiels, although not unsuitable, especially if you have your bird out a lot. Ideal For: Single or multiple medium-sized birds (parakeet, amazon, cockatiel, African grey, Cacique, Conjure). 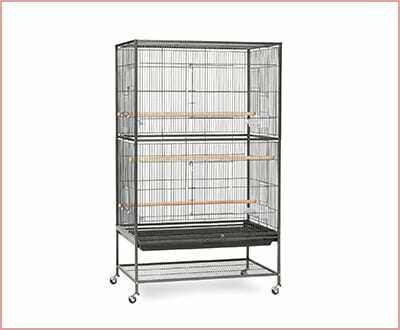 This cage is perfect for one or two conures, Quakers, cockatiels, or lovebirds. It is a huge and elegant cage that is very aesthetically pleasing. A dome on the top opens up into a playstand. Your medium-sized bird will feel right at home! Excellent price for the size. Removable metal grate and plastic tray that make cleaning easy. Too large for small birds – they can get stuck in the bars. Latches might not be adequate for an escape artist. 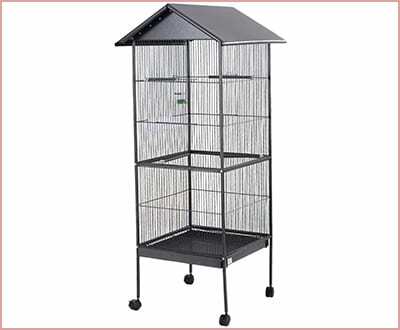 Ideal For: Multiple small to medium birds (lovebirds, budgies, finches, canaries, smaller conures, cockatiels, and Australian grasskeets, or parrots). This cage is absolutely huge for its price. You can easily fit a flock of small birds or a few medium birds in here. It has a good design, and will look very nice in your home. Very reasonably priced for the size. Difficult to access the bottom of the cage. Ideal For: Small birds (parakeets, canaries). 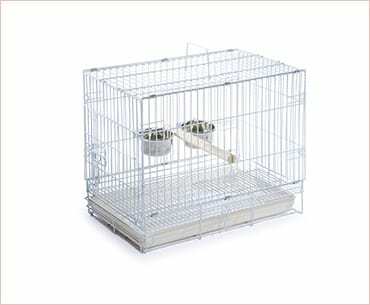 This cage is another attractive option for a small bird or a pair of small birds. It comes in several attractive colors, and the design is thoroughly unique. This is one of the best bird cages suitable for hanging up. Too small for two parakeets. Small food and water dishes. Ideal For: Multiple medium-sized or small birds (parakeets, canaries, or finches). 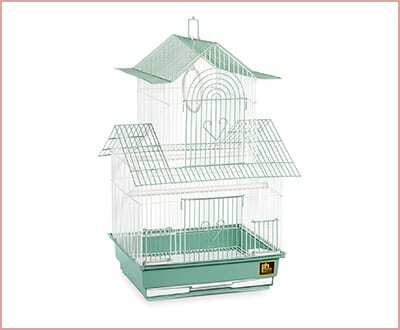 This Prevue model is a massive cage for people who want to make sure their large bird or flock of small birds have plenty of room. It’s a bit pricey, but highly durable and made of quality wrought iron. 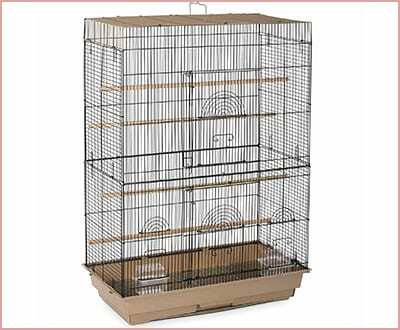 This is a cage for serious and experienced small bird owners who know how much space their birds need. The bottom slides out, making it easy to clean. This is a very large cage, so finding space for it might be difficult. Not suitable for a very strong large bird like an African grey parrot. 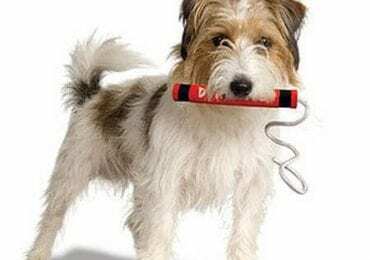 Ideal For: Small birds such as parakeets, canaries, or finches. This cage will be a great home for a single smaller bird or a pair. It is very spacious, to give your new friends room to fly, and is made of high-quality material. The cage is also lightweight, and will work with nearly any stand. Your small birds will love it! Good for beginner bird owners. Not ideal for housing any birds larger than a single cockatiel or pair of parakeets. The bottom grate does not slide out. Ideal For: Small to medium-sized birds (parakeets, cockatiels). This cage will be a great home for your new parakeet or cockatiel. It is much bigger than it looks, and your birds will have plenty of space. It comes in both blue and green, and at a very attractive price. Spacious cage, without being massive. Easy tray removal at the bottom. Ideal For: A pair of small birds (canaries, budgies, lovebirds, and finches). If you’re looking at getting a pair of budgies, this Vision Bird model is one of the best bird cages available to you. The plastic base does a good job of keeping any mess inside the cage. The doors open inward, and serve as cool landing pads. It’s an excellent choice for the price! Four doors for maximum access. Ideal For: Multiple small birds, or two to three medium birds (parakeets, canaries, or finches). 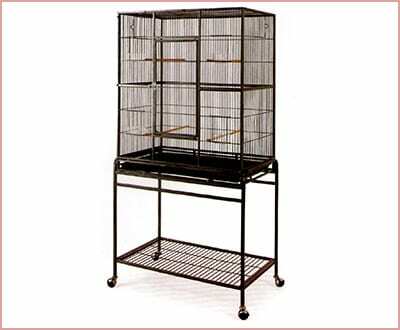 This Mcage model is simply one of the best bird cages available because of its flexibility. It can fit a lot of different types and number of birds – everything from a small flock of finches to up to three cockatiels. It’s a good fit for conures too. 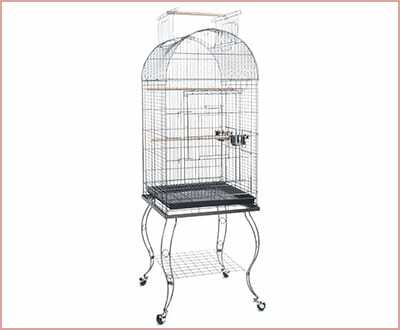 It’s a very sturdy cage made of quality wrought iron material, at a good price. Well-constructed with quality wrought iron material. A good option for many different types or combinations of birds. Not suitable for large, strong birds. Remember to always carefully research the species of bird you are hoping to get, and determine how much space it really needs, before you purchase a bird cage. It’s always better to have more space than too little. 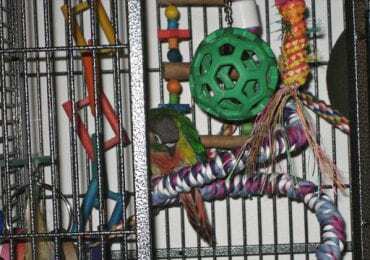 Hopefully, this list of best bird cages has given you some ideas. Do you have a specific cage or manufacturer that has been amazing for your birds? Do you feel we missed some best bird cages worth mentioning? Be sure to share your thoughts below!